A reminder to vote today in the midterms even though it seems as though the die has been cast. A Republican majority in the Senate and a 10+ seat gain in the house seems a certainty. However, by writing in a candidate you'll be telling the money behind the two major candidates that your vote does not merely go to the highest bidder. 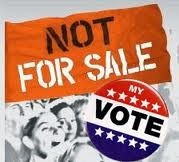 #myvoteisnotforsale. Perhaps this movement will gain ground in 2015 as ads start earlier and more often and we'll have a real chance to impact the 2016 election.